From Underground Toys! 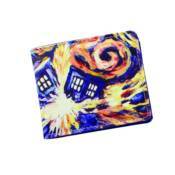 This bi-fold wallet features Vincent Van Gogh's famous painting of the exploding TARDIS on its exterior! Like the TARDIS, this official Doctor Who wallet is bigger on the inside. It includes a billfold, card slots and a clear ID display.